Free woodworking Chair plans. 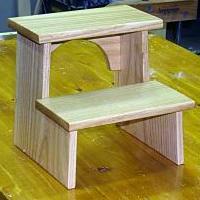 Chair woodworking plans that you can build or modify to fit your needs. Free woodworking plans of all types and sizes to meet your woodworking abilities. 20 Free Woodworking Plans found in the "Chairs" Category. Maybe you are in to LARPing or you need a project for your high school shop class. 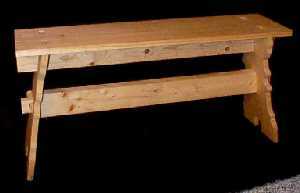 You could have landed on this page, looking for a free woodworking plan of a bench because you are opening a medieval dinner theater and you are to cheap to buy seating. What ever your reason is, you found an excellent free bench plan. They even went through the extra effort to create a prototype bench before finalizing on a design. This woodworking plan has everything you need to build this project. By the way, don't be scared by the Middle ages design. Take the extra time and create your own custom support leg design and bring this free bench plan into the 21st century. This one is for the advanced woodworker. It will challenge your dovetailing ability. This free woodworking plan calls for 2 different kinds of dovetails; Through dovetail, sliding dovetail, and tappered dovetail. It looks like a step stool to me, but I guess if you are into sewing, you know what this is. Apparently, it is used to rest ones feet underneath the sewing machine. If you try this free woodworking plan, you should be able to build it within a weekend. It might be a great project to build with the kids. After you've made the standard adirondack chair, it's time to move on to the rocker version. This free woodworking plan comes with excellent written descriptions, a materials list, and some pictures and diagrams. This is a simple, yet seemingly guick free woodworking project to build. The plans are in 3D will all of the dimensions and instructions you will need. A very simple, yet functional child's chair. Consider making 4 of these and adding a table to the mix. You kids will love this one. The free woodworking plan is in 3D with good asembly instructions and detailed drawings that should make an easy build.